MONTGOMERY, Ala. — Former Alabama Chief Justice Roy Moore holds the lead in the race for the United States Senate, polls show. According to Politico, Moore currently has 31 percent of the vote in a field of almost a dozen Republican primary candidates. Next in line is sitting Sen. Luther Strange, who formerly served as Alabama attorney general, at 23 percent of the vote. U.S. Rep. Mo Brooks holds 21 percent of the vote, while all other candidates generated less than 5 percent public support. “With roughly six weeks to go until Election Day, we must work even harder than we have to get to this point,” Moore’s campaign wrote on his Facebook page on Thursday. According to the Montgomery Advisor, Moore spoke before the River Region Republicans on Tuesday and reiterated his belief that the nation needs to return to the original intent of its founders. Among Moore’s return to roots is the restoration of states’ rights, including when it comes to health care. He outlined his belief that Obamacare should be repealed altogether and that insurance should be allowed to be sold across state lines, opening up competition. He also spoke against the U.S. Supreme Court ruling of Obergefell v. Hodges, declaring it to be unconstitutional, and lamented the recent Supreme Court ruling that required Arkansas officials to include lesbian “spouses” on the birth certificates of children who were conceived via a male sperm donor. “You can get artificially inseminated, you can do everything. But you can’t take away that there’s a father with a sperm and a mother with an egg. And it takes that,” Moore said. 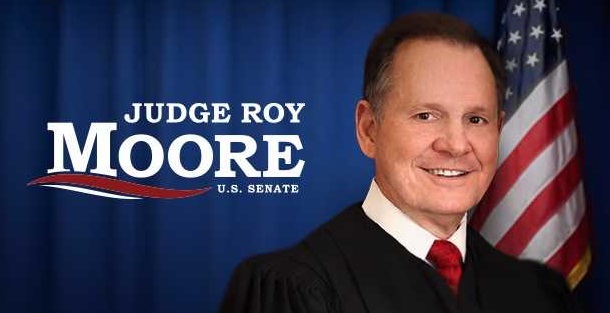 As previously reported, Moore announced his candidacy in April after losing an appeal to lift his term-long suspension issued by the Alabama Court of the Judiciary. The entity had concluded that Moore, who served as chief justice from 2013 -2016, had violated judicial ethics for issuing a memo to state probate judges—months after the U.S. Supreme Court’s “gay marriage” ruling—advising that the Alabama Supreme Court had not lifted its previous order banning the issuance of marriage licenses that are prohibited by state law. In being questioned by reporters about the matter, Moore stood his ground and was received with applause from the supporters that had gathered.